Seat kickers and trigger-happy perfume wearers, you're on notice. I love traveling and spend a great deal of time dreaming up trips to destinations I’ve never been, I've mapped out dream trips to Africa and Indonesia, typed up imaginary itineraries for a day in Tokyo and designated portions of my savings for an adventure to Costa Rica to work with rescued sloths. In my reveries, I seem to always skip over one crucial detail: how aggravating travel can be, particularly when planes are involved. It's not about the plane or the crew or even the delays that get me; it's the people on the plane: the guy snoring loudly beside me, the non-stop chatterboxes across the aisle and the kid ruthlessly kicking the back of my seat for hours on end. The list goes on. The seat-kicker has four years running as the most annoying behavior, and inattentive parents always ranks highly. "We've been looking at airplane etiquette for the past five years," Christie Hudson, senior communications manager, Expedia North America, tells NBC News BETTER. "We see some consistencies year over year. The seat-kicker has four years running as the most annoying behavior, and inattentive parents always ranks highly. It's really no surprise that some things go to the top of the list as we can all relate to how disruptive they can be." Hudson notes that the research, aimed at shedding light on passenger behavior and opinions, is also launched with the intention of showing how we can all be more considerate (and contented) passengers. "We've all been guilty of less than polite behavior when traveling," says Hudson. "But there are some really polite travelers out there." I like to think of myself as one of those really polite travelers, but I know there have been flights, where, stuck in the middle seat, I've passive-aggressively fought for the armrest, or when trying to sleep, I've stared down a babbling child with the fire of a thousand suns. And I'd wager to bet that I've also been an annoying passenger myself. My frequent choice to feast on a smelly egg salad sandwich has surely prompted groans from my fellow travelers. When it comes to how travelers can do better to both curb their aggravation and their potentially annoying behavior, Hudson notes that it "really comes down to empathy and patience." But having a few travel tricks up your sleeve can certainly come in handy. 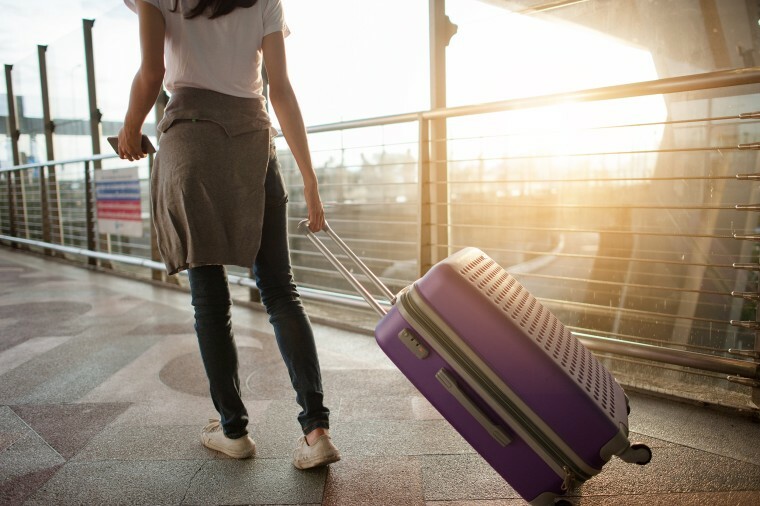 Part of what makes these our irksome behaviors so annoying is that travel is already pretty stressful, and after going through long TSA lines and other airport pains, our nerves may already be worn down. Then we get on board to find less than ideal surroundings. To cope, we should plan out as much as we can ahead of the flight. Hudson strongly recommends investing in a pair of noise-canceling headphones to block out those screaming babies and loud talkers. Valiente wholeheartedly agrees, adding that you should also turn your face away from the area of noise. The wearing of earphones can also deter people from chatting you up, with Youst noting it as "the universal sign for 'I do not want to be disturbed'." For tackling bad odors, Vanessa Valiente of V-Style, a fashion and travel blog, recommends carrying an essential oil or a face spray. "Smell it directly from the bottle to distract from the smell that’s bothering you, [or] put a swipe of it at the center of your neck to change the smell of the area close to your nose. But be careful with this: you don't want to bug anyone with your scents. For example, some people hate the smell of mint, so choose a scent with mass appeal that has a calming influence like lavender." Valiente also advises against wearing perfume on a plane, noting, "It gives so many people headaches, and affects people's allergies." "When someone is kicking my seat, bugging me or encroaching on my space, I just turn around and say, 'I'm sorry to bother you, but I think you're kicking or poking me,'" says Valiente. "This usually prompts a quick apology and an end to the nuisance. I have also asked people to scoot over a bit, and they always comply. Being sincerely polite, but upfront, is key. If kids are old enough to understand, I do the same thing with them. Children are easily intimidated by strangers and respond to direct conversation, so treating them like an adult and politely asking them to stop whatever it is they are doing always works for me." If a child keeps on kicking, Jacquelyn Youst, president of the Pennsylvania Academy of Protocol suggests asking their guardian if they wouldn’t mind switching seats with them. A personal space violation is often the result of the person in front of your plowing their seat back into your legroom. Before reclining, take a moment to check out the person behind you and whether reclining would be an imposition. "Make sure the person behind you is not eating, using their laptop, or 6’9” tall," says Youst. "Ask if it’s alright to put the seat back a little. If they say no, don’t be offended." Expedia also ranked the most common hotel annoyances and found that "inattentive parents" topped the list (45 percent). Kris Morton, a frequent business traveler and travel blogger at Nomad by Trade notes that a little parental supervision can go a long way. "I've seen kids in the hotel gyms swinging from treadmill handles like they were monkey bars, and at the free breakfast buffet using their bare hands to dig through the cereal dispensers so that the hotel staff had to throw away the entire container," says Morton. "When traveling with kids, make sure that the kids understand that this isn't home and that there are other people on the other side of the walls who may be trying to get some sleep." Your fellow travelers may be breaking the golden rule of treating others as they want to be treated, but you should keep this principle intact. "Just because you want to push past me to get off the plane doesn't mean I'm going to push back," says Peter Lombard, founder at Globe Guides, adding that if we're exacerbated by the behavior of others, we should take responsibility of that feeling, and do what we can to prevent sinking into negativity. "If I'm easily annoyed I need to take responsibility for that and travel in ways that manage my annoyance," says Lombard. "If I don't have patience I need to arrive at the airport during a quiet time. If I want good customer service I may need to spend a bit more on my hotel. If I'm going to get frustrated by a long and messy taxi queue, then I should request a car. If I'm not willing to do that, then I need to know that's my choice and I need to be patient."